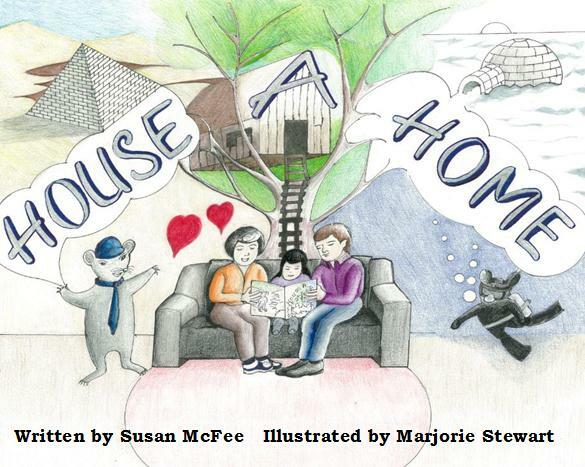 Great cohousing and intentional community books, as well as a link to a slide show, a video about Canadian cohousing, and a radio documentary. 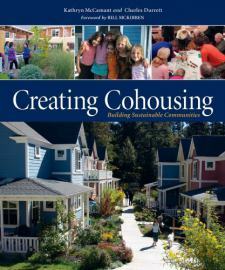 To order your high resolution version of Building Community with Cohousing suitable for large screen viewing, please contact alan.carpenter@gmail.com to order. To view on your browser, please click the play button on the player on our home page. In Building Community with Cohousing, film makers Dany Gagnon and Regan Payne interview cohousing residents from WindSong Cohousing Community (completed 1996), Cranberry Commons Cohousing (completed 2001) and Roberts Creek Cohousing (completed 2005). This video is entertaining, informative, heart-warming and inspiring. 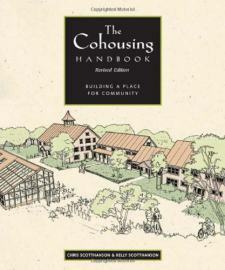 It provides a general overview of the concept and can be used to help educate the general public, developers, planners, and people interested in joining a completed or forming cohousing community. 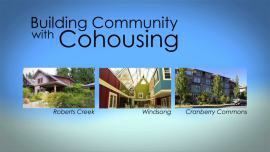 The video was produced by the Canadian Cohousing Network, funded by the membership of cohousing communities in Canada. Introducing the new cohousing “bible” with many new North American case studies, design principles and sustainable design practices. With over 120 cohousing communities now in existence in North America, Katie McCamant and Chuck Durrett bring us a totally updated “must-have” book for anyone interested in creating more people-friendly neighborhoods. The new book is a fully-illustrated manual that combines nuts-and-bolts practical considerations, design ideas and real life examples – all of which are illustrated with extensive case studies of diverse communities in Europe and North America. 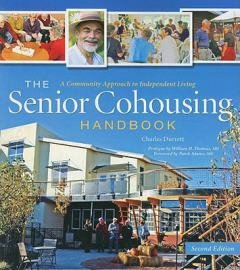 Creating Cohousing draws on the author’s wealth of experience designing, developing and living in these cutting-edge neighborhoods, with chapters on cohousing and sustainable design principles, and illustrates how cohousing offers a uniquely rewarding type of housing for anyone who values their independence but longs for more connection with those around them. Read the book that started it all. A movement that began in Europe has taken hold in North America because it provides some real answers for the increasing number of people who stop to look at where and how they live and at their impact on the environment. Cohousing is a way for a group of people to work together to develop places to live that offer both privacy and community with the values of an old-fashioned neighborhood-safety, independence, mutual concern. Many of these new ventures are up and running and many more are in the planning stages. Delivering more bang for the buck, this innovative approach to housing is challenging the formidable housing problems we face, and it is succeeding. 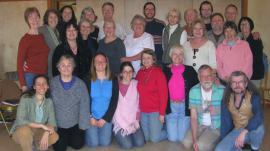 As pioneers in the development of cohousing in North America, Chris and Kelly ScottHanson offer individuals and new groups a wealth of information and practical hints on how the process works. The Cohousing Handbook covers every element that goes into the creation of a cohousing project, including group processes, land acquisition, finance and budgets, construction, development professionals, design considerations, permits, approvals and membership. 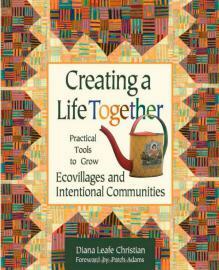 This book provides step-by-step practical information on how to establish an intentional community. It deals in depth with structural, interpersonal and leadership issues, decision-making methods, vision statements, and the development of a legal structure, as well as profiling well-established model communities. Devant l’incontestable urgence de changer notre mode de vie, de plus en plus nombreux sont ceux qui se tournent vers des alternatives , comme les cohabitats, les écovillages et les communautés intentionnelles. 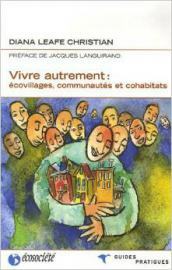 La vie en communauté est un choix parfois difficile, mais intelligent, qui permettra à de plus en plus de gens de rejeter le système égoïste de l’« auto-boulot-bungalow » et de vivre en harmonie avec l’environnement et avec leurs valeurs. Currently, seniors represent a record 12.4 percent of the American population, which, with the swell of post-WWII baby boomers entering seniorhood, will increase to 20 percent by the year 2030. Clearly, action must be taken, and quickly, to correct these household and community shortcomings. But what can be done, and by whom? How can we better house ourselves as we age? I believe that the answer lies in senior cohousing communities. Having visited many of these communities, I’m now a firm believer that 20 seniors stranded on a desert island would do better at taking care of most of their basic needs than the same 20 left isolated or in an institution. 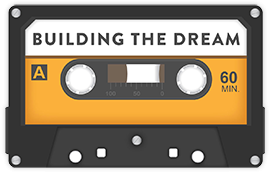 Building the Dream is two-part audio cassette series about cohousing originally produced for CBC Radio’s Ideas program. 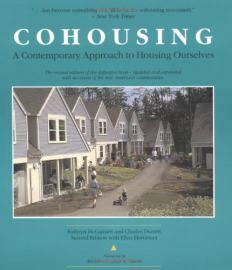 The series includes visits to several cohousing communities in British Columbia, as well as interviews with Jan Gudmand-Hoyer, the originator of cohousing in Denmark, Kathryn McCamant, co-author of Cohousing: A Contemporary Approach to Housing Ourselves, and Dolores Hayden, author of Redesigning the American Dream. The purpose of this PowerPoint presentation is to inform people new to Cohousing about what it is, what it offers and the forms it can take. You don’t need a PowerPoint program to use this presentation because it is available in a self launching format that will run on any Microsoft operating system.